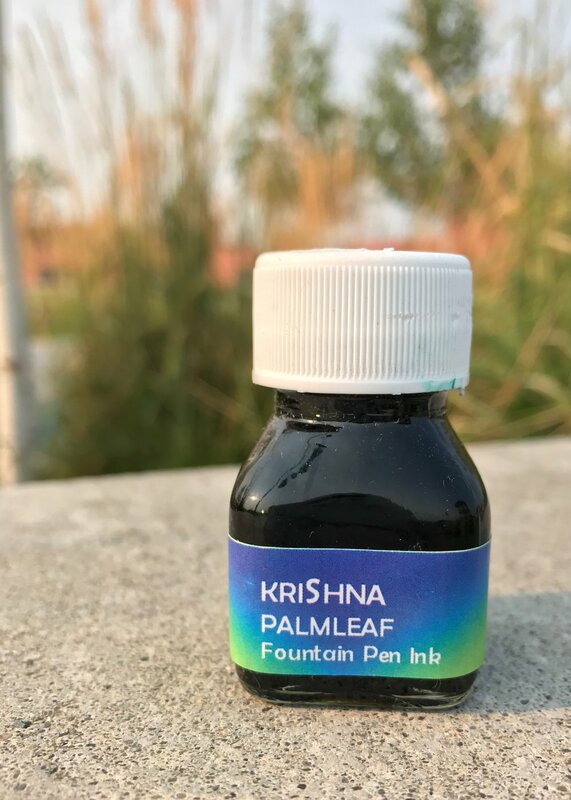 Krishna ink is made by Dr. Sreekumar, who started making fountain pen ink in 2010. He makes the ink in his workshop in Kerala, India. Today we are going to talk about Krishna Palm Leaf, which is part of the super rich series of inks. I got my bottle of Palm Leaf from The Pen World. The bottle holds 20 ml of ink. Palm Leaf is a bright medium green with no sheen. In large swabs, Palm Leaf looks a lot darker than it does in most writing. This swab took about three days to dry. When concentrated, the ink almost looks black. I noticed that in a broad nib, Palm Leaf looks black. It looks like a different ink than the other nib sizes do. Dry time: On Rhodia paper in a medium nib, Palm Leaf took 45 seconds to dry. Feathering: Palm Leaf only feathered on Baron Fig paper. Show through: Palm Leaf had medium show through on all of the papers. Bleeding: Palm Leaf only bled on Baron Fig paper. Ink swabs for comparison, left to right: Diamine Ultra Green, Krishna Palm Leaf, and Diamine Woodland Green. I think Woodland Green is the closest match to Palm Leaf. To see swabs and links to all of the Krishna inks i have reviewed so far, click here. Left to right: Diamine Meadow, Robert Oster Peppermint, and Robert Oster River of Fire. To see swabs and links to all of the green inks I have reviewed so far, click here. I used a medium nib on Tomoe River paper. When I opened the pen to use it, it had ink all over the nib. I wiped it off, and started writing, and two words in the nib was covered in ink again. This ink has nib creep really badly. Overall, Palm Leaf had a long dry time, inconsistent color, and nib creep. If you are looking for a well-behaved green ink, I would suggest trying Diamine Woodland Green. Disclaimer: I received this ink free of charge from The Pen World, in exchange for an honest review. There are no affiliate links on this page.